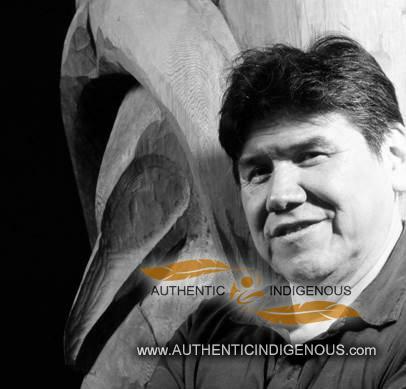 Jacob Lewis was born into the Squamish tribe of the Coast Salish Nation in 1955. He has been carving since the tender age of seven and became prolific in his 20’s. Jacob transforms a carving of yellow cedar into a work of complex design where integrated hidden crest figures are sub-plots within the larger work. In a simple Sun, one might see several Ravens, Eagles and perhaps a Bear or whale. Even the eyebrows and cheeks of the figures become secondary creatures themselves. He’s become internationally renowned for his elaborate original designs, and is best known for his ability to bring traditional and contemporary forms together. Although Jacob adheres to the established rules of Northwest Coast Native art in shape and form, he adds a modern dimension that is completely his own. It is this tension between the old and the new that makes Jacob’s work so compelling and alive. Jacob’s work has been displayed in exhibitions all over North America and remains a part of prominent private collections throughout the world.